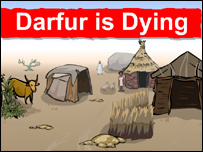 I was reading Marko's blog recently and he posted a link to the online simulation "game" called Darfur is Dying that places you as a character in a refugee camp in the middle of the Darfur genocide. You begin the game guiding your 10 - 12 year old character to forage for water while running and hiding from the militia. It's virtually impossible to evade capture and return with water to your village. The game continues with life in a refugee camp as your character makes decisions to help them and their family survive. Of course, the most significant part of playing the "game" is when you remember that the same thing is actually happening in real life. As your adrenaline starts to flow while running away from the militia, it's heart breaking to realize that at this very moment children are hiding and cowering in fear while soldiers pursue and capture them. Surely God grieves at our indifference to this tragedy. The Genocide Intervention Network has posted ten ways we can take action right now and have a hand in stopping genocide. I wish I had an answer, but I do know we all need to do more. May peace survive throughout the world.